This tutorial will show you step by step how to change video format (convert videos) in a few different ways using free and paid software. This tutorial works for all video formats, such as MP4, MKV, AVI, MPG, WMV, MOV, and FLV. Video encoding is the process of converting digital video files from one format to another. Encoding is also known as “transcoding” or “video conversion”. Most people convert their videos (mostly movies) so that they can play the video file(s) on their computer, smartphone, game console, DVD-player, tablet, smart TV, media player or upload and share the video file(s) on YouTube, Facebook, Vimeo or Daily Motion. A video converter is software designed to change video formats. Video conversion software allows you to convert videos from one format to another. A video file format is a type of file format for storing digital video data on a computer system. A video file is usually compressed to reduce file size and normally consists of a multimedia container, which is a digital file format that holds audio, video, and subtitles. A video container exists solely for the purpose of bundling all of the audio, video, subtitle, and codec files into one organized package. You can find Wondershare Video Converter Ultimate here. Tip: If you want to add subtitles to your video file, then place the subtitle file in the same folder as the video file and make sure that the subtitle file has the same filename as the video file. 1. Open Wondershare Video Converter Ultimate. 2. Click on + Add Files at the top left. 3. Go to the video file stored on your computer. 4. Select the video file and click on Open. Or double-click on the video file. Wondershare Video Converter will now load the video file. 5. At Target (right side), you click on the ▾ (down-pointing triangle) button. 6. Select a video format or device. 7. If you want to add subtitles to your video, then make sure that the subtitle file is selected. Usually, it's selected by default if you placed the subtitle file in the same folder as the video file and gave it the same filename. If the subtitle file is not selected you click on the button, click on Add Subtitles, select the subtitle file and then click on Open. 8. If you want to edit the video (trim, cut, crop, add effect, rotate, etc. then click on one of the icons located underneath the video thumbnail, edit your video and then click on OK to save. 9. Click on the Convert button. Wondershare Video Converter will now change video format. This may take a while. The amount of time it takes depends on your computer's hardware and the file size of the video. You can find WinX HD Video Converter Deluxe here. 1. Open WinX HD Video Converter Deluxe. 2. Click on Video at the top left. WinX Video Converter will now load the video file. When it's done loading it will show an Output Profile window. 5. Select a video format or device. Tip: If you want the best quality, then turn the switch to HQ. Note: Converting in higher quality will take longer. 6. Click on the OK button at the bottom right. 7. At Destination Folder (at the bottom), you can view and change the location on your PC where you want to save the newly converted video file. To change the location, click on the Browse button, select a location and then click on the Select Folder button. 8. If you want to add subtitles to your video you click on Subtitle Disabled or sometimes you will see No Subtitle. If there isn't a subtitle track included in the video you click on Add External SRT from the drop-down list, check the Extra option, click on the Add button, select the subtitle (SRT) file, click on Open and then click on Done. 9. If you want to edit the video (trim, cut, crop, adjust audio volume, etc.) you click on Edit, edit your video and then click Done to save. 10. Click on the RUN button located at the bottom right. WinX Video Converter will now convert the video. This may take a while. The amount of time it takes depends on your computer's hardware and the file size of the video. You can download HandBrake here. A Source Selection window will appear. If not, click on Source at the top left. HandBrake will now load the video file. 5. Click on the Browse button next to Destination. 6. Select a location on your computer where you want to save the new video file. 7. At Filename, you enter a name for the video file. 8. Click on the Save button. 9. You can specify presets and custom settings. Presets: here you can choose from among the various presets. You can convert your video to MP4 or MKV, but also to a few different devices like iPhone, iPod, iPad, Android, Xbox, PlayStation, and Windows Mobile. Output Settings: here you can specify custom settings such as cropping, applying video filters, adding or removing subtitles, adding audio tracks, create chapter markers, and more. If you don't know what all of this means, then just choose a preset, like Universal and Container > MP4. 10. If you want to add subtitles to your video, then click on the Subtitles tab (located at Output Settings), click on Import SRT, select the srt subtitle file, click on Open and then select the Burn-In option. 11. Click on Start Encode located in the top menu. HandBrake will now change the video format. This may take a while. The amount of time it takes depends on your computer's hardware and the file size of the video. You can download VLC media player here. 1. Open VLC media player. 2. Click on Media (top left) and then click on Convert/Save. 3. Click on the Add button. 4. Go to the video file stored on your computer. 5. Select the video file and click on Open. 6. Click on the Convert/Save button located at the bottom. 7. At Profile, you can select a preset profile by clicking on the selection button. Tip: You can edit, delete or create new profiles using the three buttons located next to the selection button. 8. Click on the Browse button next to Destination file. 9. Select a location on your computer where you want to save the new video file. 10. At Filename, you enter a name for the video file ending with the file extension (e.g., video.mp4, video.avi, etc.). 11. Click on the Save button. 12. Click on the Start button. 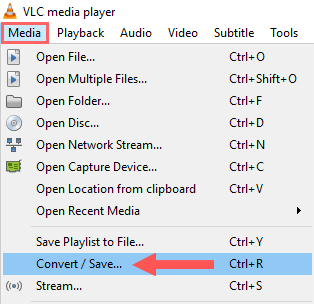 VLC media player will now convert the video. This may take a while. The amount of time it takes depends on your computer's hardware and the file size of the video. You can download Free HD Video Converter Factory here. 1. Open HD Video Converter Factory. 2. Click on Add Files at the top left. 5. Click on the video format icon at the right, below Output Format. 7. If you want to add subtitles to your video you click on T Disabled, click on Add subtitle, select the subtitle file and then click on Open. 8. At Output Folder (at the bottom), you can view and change the location on your PC where you want to save the newly converted video file. To change this location, click on the small folder icon, select a location on your computer and then click on the OK button. 9. Click on the Run button at the bottom right. HD Video Converter Factory will now change the video format. This may take a while. The amount of time it takes depends on your computer's hardware and the file size of the video.